According to this article from the Scottish Terrier Club of America, if you have never lost a Scottish Terrier to bladder cancer – or, more properly, Transitional Cell Carcinoma – consider yourself extremely lucky. Research has suggested that Scottish Terriers are 20 times more likely to get bladder cancer than other breeds and it usually occurs in older dogs (average age 11 years). Such a diagnosis can be devastating to dogs and their owners alike. 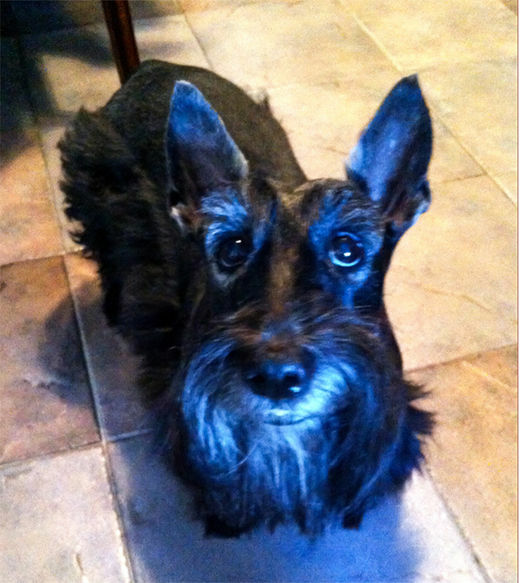 So you would be extremely pleased to meet Phoebe, a Scottish Terrier that got bladder cancer and survived it thanks to the love and care of their owners who did some alternative research and gave her vitamin C and a primal doggie diet. Let all pet owners and cancer patients know this story! 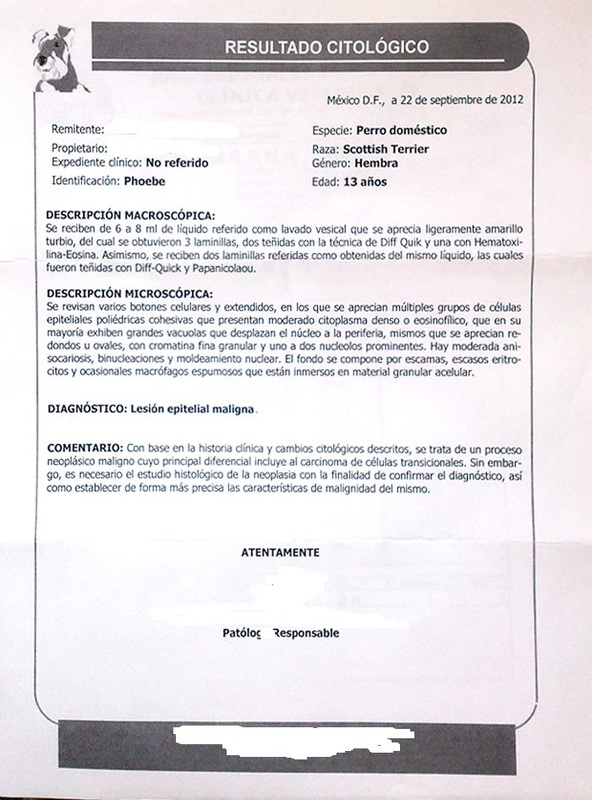 M]y uncles’ 12 year old dog (Scottish Terrier) Phoebe, had bladder cancer – Transitional Cell Carcinoma -, common in this race and mortal in almost all cases, and according to the analysis and the vet, it was an aggressive one. The veterinary told them that in 6 months the dog was going to experience a remarkable health deterioration. He suggested an aggressive therapy with very strong medication and he wasn’t even sure that it was going to help in any way, maybe just to give her more time (in pain for sure). Well, my uncles didn’t want to subject her to a painful and hard therapy and medication so they decided to search for other options. We were talking about it and the idea that the right nutrition could help to heal the body, and about the possible health damage caused by industrialized dog food loaded with carbs, chemicals and other stuff that it’s not part of a dog’s natural or proper diet. We discussed this idea [and a friend] suggested that changing her diet to lean meat may help her in someway. 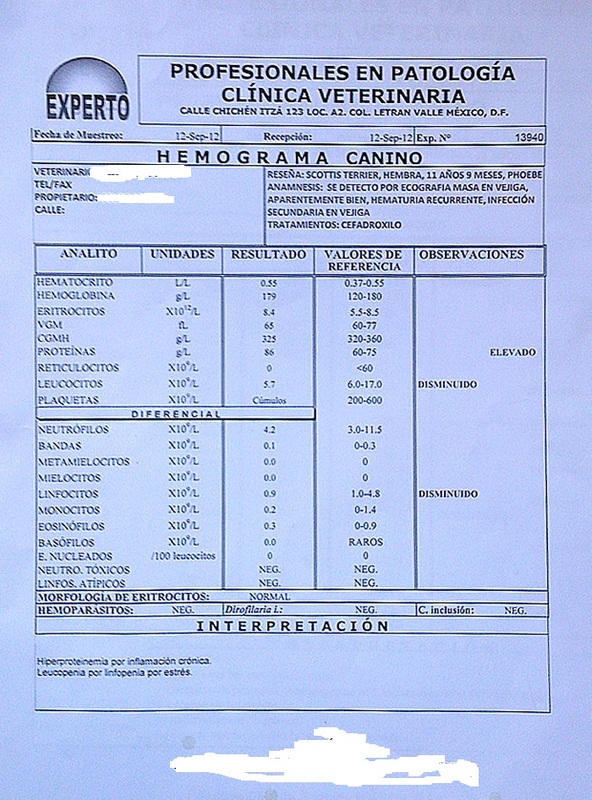 When i came back to Mexico i researched a little bit under that idea, and there are some vets now promoting a proper diet for dogs to avoid some sickness – some race’s specific -, and some for treatment. In some articles, they also suggested to give them animal organs as heart and liver – from cows, pigs or chickens – (funny that this organs are the first eaten by the alpha wolf in a pack), and also found some articles about the use of small doses of Vitamin C (depending on the dog’s size) to treat cancer in dogs. I shared the info with them, and since the end of September they decided to apply it with caution. So, in this case, all came down to getting rid of the industrialized dog food, a diet based on lean meat, heart and liver sometimes, and small daily doses of vitamin C. The result of the past week analysis: Phoebe has no trace whatsoever of this allegedly aggressive cancer, she even increased her weight a little bit, and she’s more active than before. The vets and the people of the analysis lab are very surprised by this results. According to them, she should be dead or almost there by this time. My uncle’s are very very happy because they love that dog very much. Phoebe – Wonder Doggie who healed from cancer with lean meat, animal organs and vitamin C. Such a cutie! Phoebe’s 1st ultrasound. You can see they are measuring the thickness of the tumors inside her bladder. Phoebe’s first ultrasound. The inside irregularity is the bladder cancer. Stomach, spleen, intestines and kidneys without significant changes. 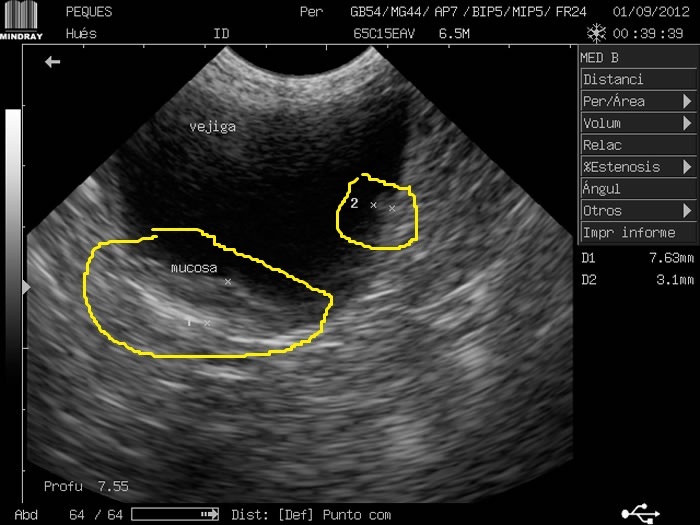 The bladder has plethora and the inner lining is irregular in certain portions. Diagnosis: Irregular bladder mucosa. It is advisable to do further tests in order to discard bladder cancer. Phoebe’s first blood work upon diagnosis. Phoebe’s blood-work upon diagnosis. 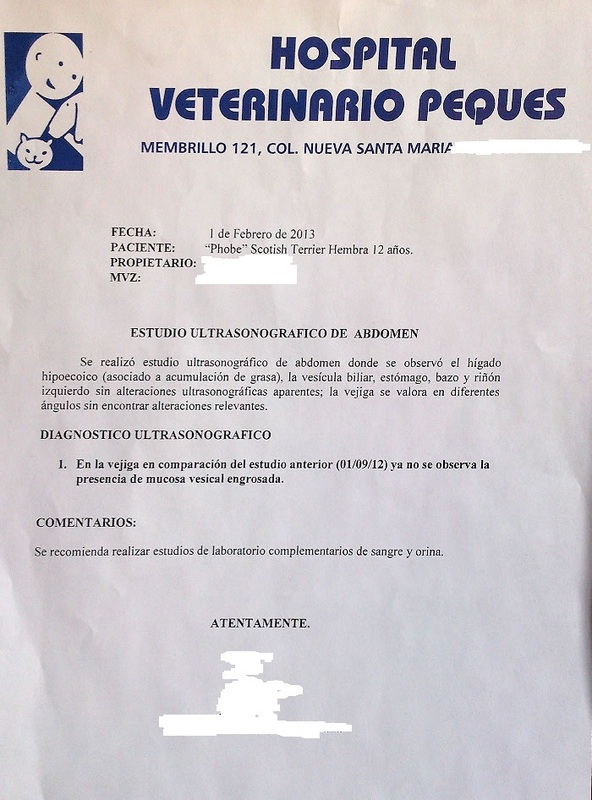 The vet’s and owner’s name were removed for privacy purposes. She had kidney failure and her liver enzymes were altered due to the illness’ stress. She also had elevated protein levels due to inflammation and other chronic inflammatory markers. Upon this results, a study of the tumor was suggested. 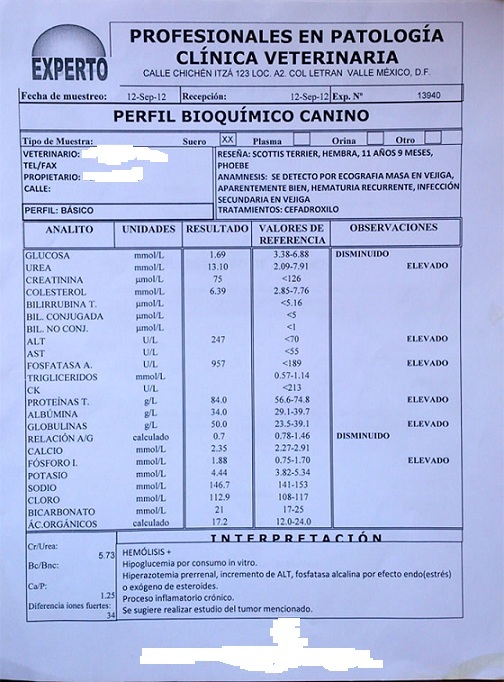 “When i came back to Mexico i researched a little bit under that idea, and there are some vets now promoting a proper diet for dogs to avoid some sickness – some race’s specific -, and some for treatment. In some articles, they also suggested to give them animal organs as heart and liver – from cows, pigs or chickens – (funny that this organs are the first eaten by the alpha wolf in a pack), and also found some articles about the use of small doses of Vitamin C (depending on the dog’s size) to treat cancer in dogs. This is fascinating to say the least! You would think that more bladder cancers will be resolved by now and many more lives saved, yes? Consider as well that Fred R. Klenner, MD. reported the following in the Journal of Applied Nutrition Vol. 23, No’s 3 & 4, Winter 1971: “In the presence of ascorbic acid, carcinogenic metabolites of bladder cancer will not develop in the urine”. Well, it seems that this knowledge based on research and common sense has yet to reach a lot of folks out there, since it seems that Phoebe’s experience is unique for a doggie her type and a diagnosis of this kind. 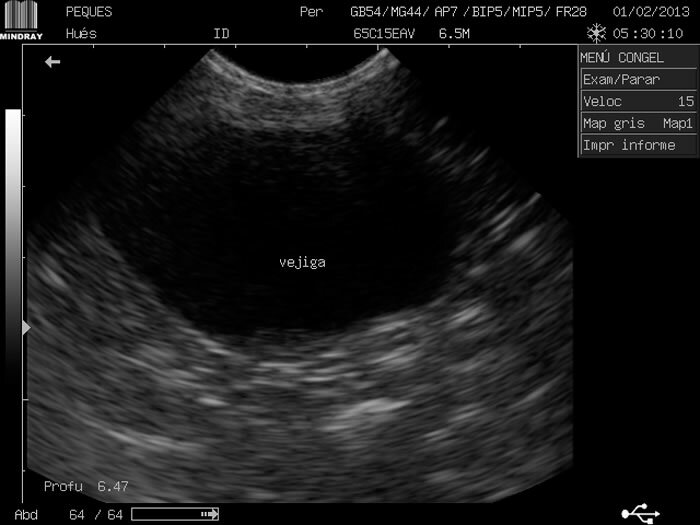 Second ultrasound (February 2013) reporting there is no cancer to be seen. Isn’t this wonderful?! We are so glad for Phoebe and their owners. May this be a testimonial for the miraculous effects of a natural diet free of artificial and processed ingredients which saw all animals thrived during millennia until Big Agra and the Food Industry arrived. But also to vitamin C’s miraculous effects. May all Scottish Terriers enjoy the same fate and benefits that Phoebe had! For more information on a cancer healing diet and vitamin C, check out Do-it-yourself liposomal nutrients, Life Without Bread, Ketogenic Diet – Path To Transformation? and Ascorbic acid (vitamin C). Wonderful for Phoebe. Oddly enough, my scottie mix (12 years) was diagnosed yesterday. 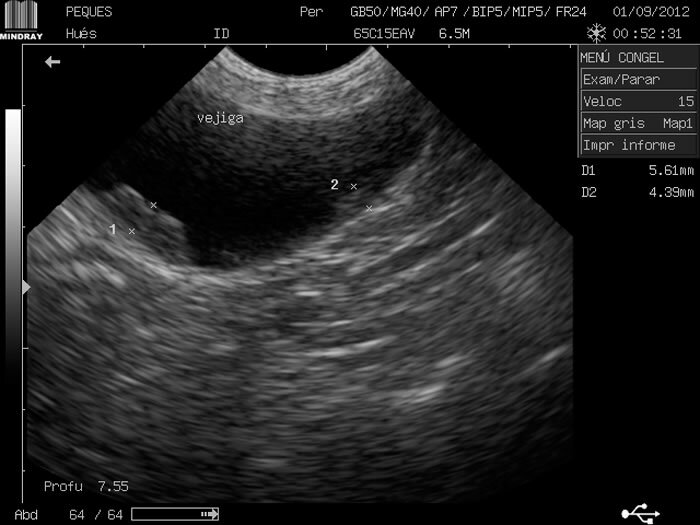 The bladder mass was a surprise, as her liver was being checked. Due to high liver enzymes our vet is reluctant to try anti-inflammatory medications. She is not symtomatic at this time. No blood in urine, eating well, etc. I’m wondering what the dosage of vitamin C was used for Phoebe and the ratio of the heart/liver to other foods. And was a home cooked diet used or another natural diet. Our vet recommended Sam E (or a medication that is a combo of Sam-E and milk thistle, as well as Vitamin E for inflammation). I’m sorry to hear about your scottie. In Phoebe’s case food was boiled and it was more lean meat than organs. For example, for every 2 cups of lean meat it would be 1 cup of organs, keeping that ratio. I’ll post here some details about Phoebe’s diet and care written by their owners. It includes the doses of vitamin C. Hope you’ll find it useful, and may your Scottish Terrier benefit from it. All the best. I wanted to share this with you, it may be useful for similar cases and the wellbeing and health of our dogs in general. If you want to know more, go deeper and see Phoebe’s analysis results before and after, i recommend you to read and this excellent article by Dr. Gabriela Segura. 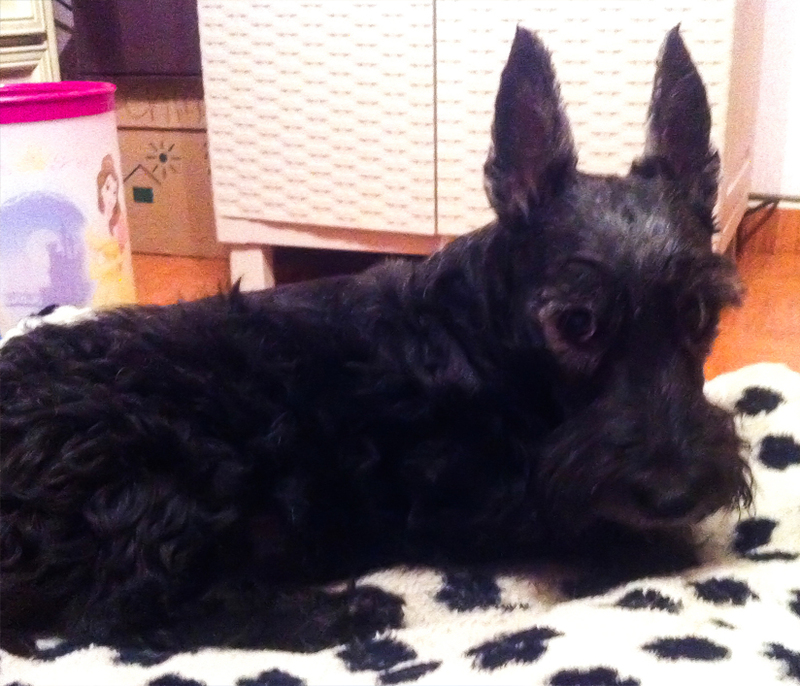 My uncles’ 12 year old dog (Scottish Terrier) Phoebe, had bladder cancer – Transitional Cell Carcinoma -, common in this race and mortal in almost all cases, and according to the analysis and the vet, it was an aggressive one. We were talking about it and the idea that the right nutrition could help to heal the body, and about the possible health damage caused by industrialized dog food loaded with carbs, chemicals and other stuff that it’s not part of a dog’s natural or proper diet. Also, a friend suggested changing her diet to lean meat may help her in someway. Knowledge that Scotties are the #1 breed affected by transitional cell carcinoma of the bladder, and that bladder cancer is the #2 cancer affecting Scotties, gives you, the Scottie owner, more information than 95% of veterinarians have. You are the person with breed specific information, and a wise veterinarian will use your knowledge. Neither the Association of American Feed Control Officials nor the 2006 Nutrient Requirements of Dogs and Cats book from the National Research Council lists a minimum or maximum dietary carbohydrate requirement for dogs–because there isn’t one. A high-protein, carb-restricted diet for a dog can aid in weight loss while maintaining lean muscle mass, according to several studies, including one published in the American Society for Nutritional Sciences journal. Dogs don’t need corn. And they don’t need wheat, barley rice or potatoes, either. Dogs simply don’t need any carbohydrate ingredients — at all. Yet surprisingly, carbohydrates represent the most common raw materials used for making dry dog food. [Then], ¿Why dog food manufacturers love carbohydrates? Please notice that not one of these reasons has anything to do with nutrition — not one. Another fallacy pertaining to meat is the notion that an all meat diet is lacking in vitamins and minerals. In fact, meats contain all of the essential amino acids (the basic structural building blocks of proteins), and they do so in a ratio that is ideal for their complete utilization. Meats also contain twelve of the 13 essential vitamins in large quantities. The first rule for feeding a dog with cancer is STAY AWAY FROM GRAINS! [and carbs of course] Dogs are not naturally grain-eaters. Over the past 10 million years, dogs evolved mainly as meat-eaters. Have you ever seen a dog grazing out in a grassy field? That’s because grains are stressful on their digestive system. Unfortunately, most commercial dog foods (even the expensive ones) include rice, wheat or corn. […]Barbara joins dog owners who use nutritional therapies in their cancer patients. In addition to piroxicam, Mack receives Vitamin C and supplements including Coenzyme QI0 […]. Barbara believes Vitamin C is a major factor in Mack’s continued good condition: “I have run out of vitamin C several times, and have noticed more blood in the urine.”..
Vitamin C improves immune function by enhancing white blood cell function and activity. It also increases the blood levels of interferon (the body’s natural antiviral and anti-cancer compound) and antibodies (proteins that destroy foreign material such as bacteria, viruses, and toxins). In fact, many veterinarians (both conventional and holistic) now routinely include vitamin C in their treatment protocols for various illnesses, including canine cancer, infections such as bladder and urinary tract infections, respiratory infections (e.g. kennel cough), and others. Some veterinarians also suggest giving dogs vitamin C as a preventative and immune booster. For example, vitamin C can be given to dogs before and after vaccination, to feeble and old dogs, to pregnant and lactating dogs, and to those that have been exposed to contagious diseases. Moreover, vitamin C maintains the health of collagen. Therefore, it is also helpful for dogs with arthritis and degenerative joint disease, hip dysplasia, and spinal disorders. – Arthritis: as high a dose as possible with diarrhea being the limiting factor, up to 5,000 mg/day. – Ear Infections: 125 mg twice daily for small dogs; 250-500 mg twice daily for medium dogs; 500-1,000 mg twice daily for large dogs. – Teeth/Gum Diseases: 125 mg twice daily for small dogs; 250 mg twice daily for medium dogs; 1,000 mg twice daily for large dogs. – Upper Respiratory Problems: 125-500 mg twice daily for small dogs; 250-1,500 mg twice daily for medium dogs; 500-1,500 mg twice daily for large dogs. – Skin Allergies: 125 mg twice daily for small dogs; 250-1,500 mg twice daily for medium dogs; 500-1,500 mg twice daily for large dogs. – Bladder and Urinary Tract Infections: 125 mg twice daily for small dogs; 250 mg twice daily for medium dogs; 500 mg twice daily for large dogs. – As Immune Booster: 500 mg twice daily for small dogs; up to 1,500 mg twice daily for medium dogs and large dogs. If your dog develops diarrhea, adjust down the dosage until the stools are firm again. […] Another nutritional strategy could be garlic. Research (Cancer, vol 79: pp. 1987-1994, 1997) shows garlic as a possible new effective treatment for transitional cell carcinoma of the bladder. Mice treated with garlic orally had significant reductions in both tumor volume and mortality. Garlic is worth a try for dogs with bladder cancer. Aged garlic tablets (like KyolicÒ) do not promote offensive odor and are easy to give. Dog ancestors food: Wolves usually tear into the body cavity of large prey and consume the larger internal organs, such as lungs, heart, and liver. The wolf’s diet consists mostly of muscle meat and fatty tissue from various animals. Heart, lung, liver, and other internal organs are eaten. Warning: Avoid making a drastic change in your dog’s diet, if he/she is in a industrialized dog food diet or a high carb diet (as in industrialized dried dog food) you need to make a smooth transition, in this case was of 1 week. They mixed the dried dog food with the lean meat and organs, increasing the quantity of these last and reducing the dog food. In this case, with the Vitamin C it may be the same process, at the begging Phoebe’s body only accepted 1 gram per day (then she presented diarrhea), and it was increased to 2 grams per day in a week with no problems and no diarrhea. Vitamin C acts as a safe chemotherapeutic agent in high doses which can be delivered intravenously. Perhaps it would be worthwhile to find a practitioner near your location for an opinion. I can attest to the miraculous effects of vitamin C in humans and I would consider it for beloved pets. There’s also mistletoe extracts used in veterinary medicine such as viscum quercus. At the very least, it would help relieve pain and improve quality of life. Hope it helps. I was happy to find this article and webpage as I am attempting to treat my 15-year-old Beagle’s Transitional Cell Carcinoma with a ketogenic diet (which I have already used for myself for the last 3 years with great success). Thank you so much for all the information. I will definitely start adding some Vitamin C to my dogs diet and also some magnesium and possibly CoQ10. That is great Birgit, thank you for sharing! After doing more reading I think I will also add turmeric and coconut oil to my dog’s diet. I was trying to find out if there are any trials of ketogenic diets (human or animal) for TCC but was unsuccessful. My previous dog was a rescue. I fed her the best dog food I could get from the vet. I did give her some cooked meat and possibly raw scraps on occasion, but I was pretty strict. Around her 12th birthday she whimpered one Sunday night and I gave her some glucosamine and chondroitin and she whimpered no more. But the next morning I took her to the vet, just in case. X-rays showed an enlarged heart (I immediately saw that but was pre-occupied by her liver, which was massively white). It was cancer. In short, she had little time left. Because of her mistreatment early in life she was very attached to me and I had done the best for her, I thought. She lived about 3.5 months longer and when she would no longer eat (she loved her food, was only slightly overweight) I had to have her pain ended. It was not a good experience, for in my worry, and in desperation, I had allowed the vet to open her up and look to see if it was cancer that could be treated, which was just more stress on her. (It was so obviously not operable.) I cannot get that last memory, holding her as she died, out of my mind. My present Corgi was fed the best vet-commercial food until she turned ten, five years ago—I finally woke up to the obvious. I put her on the BARF diet (Bones And Raw Foods, or Biologically Approved Raw Foods) and I went full paleo—I have naturally followed the O Blood/Atkins diet most of my adult life, meat, fat, fewer carbs; our diets are far stricter. Sadie began going deaf early last year, age 14, and was completely deaf by June. (Moh had started going deaf at age twelve.) Sadie had bad hips and pain going up stairs a year and a half ago and I had made ligament and bone broth for six months, which did nothing. I ground up the raw ones I had left and she got some with each meal. Surprisingly, after three days she was scurrying up and down the stairs. I tried them raw, myself, and found they took most of my sore hip pain away. (Raw they have the taste and texture of elastic bands.) We have been eating them this way for about 18 months. But about four months ago her hind legs started giving out so now I have to carry her up and down stairs again. And here is why I am writing all this. Sadie gets a high FAT, low protein BARF diet. I believe, or suspect that like humans, an old dog does not need a lot of protein, or food for repairing torn and used muscles. Fat is energy, and possibly why dogs and wolves in the wild go for it first. I have even cut back on the fat a bit as she really is not using up much energy at her age and I want to keep her weight down and pressure off her hips and legs. I suspect fat is the energy of life, meat or protein repairs worn muscle and carries vitamins and necessary micro-nutrients, and that carbohydrates are of little use unless you are an exuberant athlete. Pets can become as kin and best friends—close to the heart while here and when gone. I have so many regrets over the little abused dog I adopted and how I let her down. I did not know better, we didn’t have the internet for good study, but regrets are rarely tamed by excuses. And I wonder if my Sadie might have held onto her health a lot longer if I had put time into study much earlier. There are lessons for humans here, as well. I am sixty-four, as the song goes, have a very strong heart, practice paleo, and do not fear fats. They make up the majority of my calories. I have very little need for muscle building and therefore extra protein. And I choose to eat only once a day. Food is not my entertainment, now. And my weight is around BMI 27, overweight I am told. But some studies from Sweden show that older people who are overweight survive longer than those at proper weight and a lot longer than those with lower BMIs. Still, studies must be questioned. We must do our research and study, for we are the ones responsible for our own health and that of our children and pets. my 18 year old dog – we think pom and American eskimo has TCC but it is operable. He has a heart murmur and Cushings disease. We are deciding on surgery, chemo and meds and wouldl like input and specifics on diet and alternatives. He acts like a puppy still most of the time. Cushings will make healing more difficult and be problematic with some of the drugs that the oncologists suggest – Piroxicam being the best suggestion. Also any recovery suggestions if all agree to proceed with surgery. The dog will have to sleep downstairs and there is one stair from inside to outside to jump down off of. Anyone know of a good ramp, the most comfortable collar that has no pvc, a super soft dog bed and anything i can put down on the wood floors to protect them? Any and all suggestions for easing the stress of all this for our beloved dog and us please advise. Other than the recommendations in this post, you can see about using DMSO and even iodine. The doses would have to be pediatric ones, but it is also used in animals. You can do a search of each one of them for veterinary care. It will ease the pain and will act as anti-cancer agents. All the best!